Fans of the Indianapolis Colts and New Orleans Saints will obviously be pulling for their teams in this weekend’s Super Bowl XLIV contest in Miami, hoping that their team not only triumphs but does so in the most efficient manner possible. No offense to the Colt and Saint faithful, but the rest of us who have no dog in this particular hunt are just hoping for a compelling football game. The law of averages says we’re due for a stinker. The last two years—the epic Giants-Patriots tilt in 2008 and the surprisingly tasty Steelers-Cardinals bash in 2009—both came down to the wire. Common sense dictates our run of good fortune has to end at some point, and that could very well be Sunday when the Saints and Colts conspire to give the world three-plus hours of tedium and foregone conclusions masquerading as an athletic contest. The sports fan in me hopes this isn’t true; the pessimist in me fears that it is. What’s a football fan to do should the Super Bowl go off the rails super-fast? If that fan also happens to be toting an iPhone or iPod touch, an assortment of apps promise to augment your footballing experience. In advance of the big game, I took a look at several apps aimed at enhancing your football-watching experience, getting you fired up for the action, or giving you a source of cheap amusement should either team fail to deliver an exciting contest. 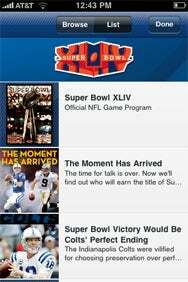 Programming Notes: Super Bowl XLIV Official NFL Game Program delivers the souvenir program to your iPhone or iPod touch. But it’s not in a very mobile-friendly format. Super Bowl XLIV Official NFL Game Program from Iceberg Reader delivers the official souvenir program for the big game—the same printed one you could order from NFL.com for three times the price—in mobile form. The program includes news and notes about the two teams vying for the Vince Lombardi trophy, along with feature articles about Miami, past Super Bowls, and notable football greats (as well as, oddly enough, CSI Miami star David Caruso). As an added bonus, the app also includes the program for last weekend’s already-forgotten Pro Bowl game. I thought that the Super Bowl XLIV Official NFL Game Program app might be the ideal game-time companion; indeed, tapping the screen, summons up a Game Center option that accesses stats from NFL.com. Unfortunately, the controls aren’t all that smooth. You read the articles by scrolling up and down. A sideways swipe jumps you to the next article… eventually. Usually, there’s a bit of a delay, and when the page does turn, it flips up or down, as if you’re reading a notebook and not a magazine. You can pull up a table of contents, but the descriptions of articles are cut off, no matter if you’re looking at them in Browse or List view. Facts and Figures: The Super Bowl game program app includes information on the game’s history, which you can view in portrait or landscape formats. 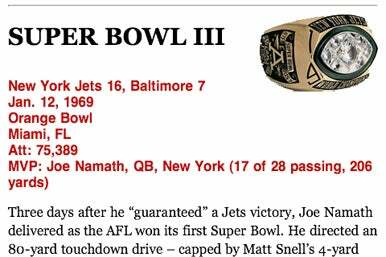 To its credit, Super Bowl XLIV Official Game Program lets you read in either portrait or landscape orientations, and it bookmarks the last page you were reading. However, switching orientations can cause you to jump ahead or backward in the article. And there’s little attempt to optimize the content for the iPhone—pictures are just slapped into articles without much thought as to how they’ll look on the iPhone’s screen. In another example, the Pro Bowl program features a list of every player who’s ever played in the NFL’s all-star game, but you have to scroll from one end of the list to the other—you can’t jump to a specific letter. The app is also prone to crashing. Game-Time Snack: Super Bowl Foods tells you how to make appetizers and main dishes for your Super Bowl party. But if you want to know what ingredients go into a dish, you’ll have to hit a separate tab. I don’t know about you, but I expect to spend most of the three-and-a-half-hour run time of the Super Bowl stuffing my face. I thought Super Bowl Food from FeelSocial might be able to help me plan out my menu, but unfortunately, the $1 app fell short of my expectations. The food doesn’t seem particularly tailored to a Super Bowl-themed event. I don’t recall having too many soups at the Super Bowl parties I’ve attended over the years, yet this app offer more than half-a-dozen such recipes. One appetizer in particular is billed as “great for summer parties”—I know football season may seem interminable to some, but it hasn’t yet crept into June. Whether or not the dishes in Super Bowl Food sound appetizing—and some, like Chicago Dog Salad, strike this self-styled gourmand as sadness on a plate—the big problem with the app is one of organization. The main screen for each recipe features a tiny picture and brief description of the dish, along with instructions on how to make it. Care to know the ingredients? That’s another screen, friend—you’ll have to jump between that and the Method page to make sure you’re using the right amount of onions at the proper moment. And be sure to only use the icons at the bottom of the screen when jumping between those pages. The Back button at the top of the screen takes you out of the recipe entirely. 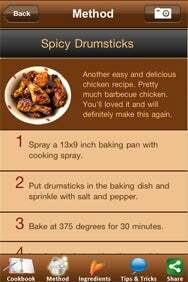 Unlike many recipe apps in the App Store, Super Bowl Food lets you easily e-mail yourself a recipe (or share it via Facebook or Twitter), so your food-stained hands aren’t smearing your iPhone’s screen. Still, this app—and indeed, the vast majority of the recipe apps for the iPhone and iPod touch—need to take a page out of Christmas Recipes’ book when it comes to organizing a mobile cookbook. A Word from Our Sponsors: A+ Superbowl Commercials delivers links to memorable Super Bowl ads from recent years, as well as GoDaddy.com commercials. “A+” is in the eye of the viewer in this case. The free app features no less than three of the execrable GoDaddy.com ads, and if there’s a significant number of people walking this earth thinking to themselves, “Man, I wish I could watch one of those old GoDaddy.com Super Bowl commercials right now,” then I’ve seriously misjudged humanity’s reason to continue living. The App Store page for A+ Superbowl Commercials does clearly state that it only features ads from “the past few years.” And that leaves out a certain ad introducing a certain computer that aired during Super Bowl XVIII, setting the standard for future Super Bowl advertisements. Indeed, if you go through MSNBC’s list of the greatest Super Bowl TV spots, only two appear in A+ Superbowl Commercials, even though all of those ads are easily to track down on YouTube. Free app or not, there are some really disappointing omissions here. You can always turn to Madden NFL 10 or NFL 2010 to get you in the mood for the upcoming game… or to command your attention in case of a blowout. If you’re more inclined toward casual games, though, you’ve got plenty of football-themed options—including one must-have game for the pigskin set. Kicking It Up a Notch: In the past year, Jirbo has improved both its Paper Football (pictured here) and iFootball games to iron out some of the more annoying flaws. First, though, let’s examine some other contenders, most notably a few apps I reviewed last year that have undergone enough improvements in the ensuing 12 months to merit a second look. Jirbo Paper Football and iFootball by Jirbo—both, as you may have deduced, from Jirbo—were pretty poor offerings when I looked at them last year. 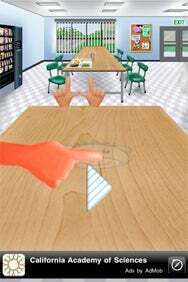 A variation on the old paper football game where you slide the ball from one end of a desk to another—Paper Football recreates the desktop playing surface while iFootball uses an actual gridiron—Jirbo’s games suffered from flaws the last time I played. Most notably, in two-player games, Player Two had more difficult time scoring and, as a result, winning. That’s since been corrected, and iFootball has further moved the ball forward by improving its graphics. The games are still flawed: they consist of 30-second quarters, but with no shot clock it’s easy for the person who’s in the lead to simply run out the clock. What’s more, Player Two still has to flip the phone around to attempt an extra point after scoring. But at least Paper Football and iFootball no longer feel rigged. 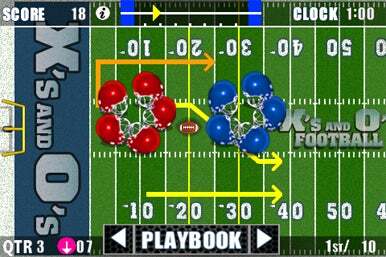 Three Yards and a Cloud of Pixels: X’s and O’s Football now features running plays, though the blue-helmeted defenders haven’t upped their game any. Subsequent updates haven’t improved the defense dramatically. But at least now, you can call running and kicking plays in X’s & O’s Football, adding a little variation to the gameplay. You can only kick extra points—field goals are for the weak-willed in the world of X’s & O’s—and the running plays won’t gain many yards, but I find it a more enjoyable simulation with these options. Skyworks makes a lot of football games, including Arcade QB Pass Attack, which I recently revisited. But there’s more to life than just tossing the old pigskin around—there’s also kicking and running. 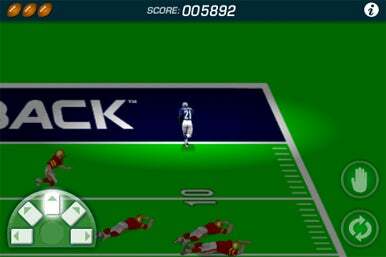 To that end, Skyworks offers Field Goal Frenzy, a kicking game, and Speedback, where you’re attempting to avoid enemy tacklers who’d like nothing better than to lay you out with a crippling injury. The Lonely Kicker: In Field Goal Frenzy’s Classic mode, you’ve got to successfully split the uprights from different distances and angles. But make sure to pay attention to the wind. Of these two games, Field Goal Frenzy is the more enjoyable offering, though it has plenty of shortcomings. 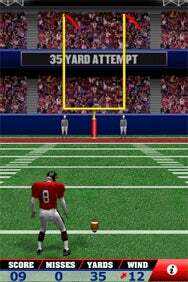 You’re a lonely placekicker who’s either got to split the uprights from different angles in a set amount of time (in the game’s Arcade mode) or from ever-increasing distances with only a set number of misses (in Classic mode). It sounds easy, until you have to account for the wind, which can blow in different directions and at different strengths from attempt to attempt. I was not very good at judging the wind, which severely impacted my enjoyment of the game. Sometimes, I would forget to take the wind into account and watch helplessly as the football was carried away from the upright by what were apparently hurricane-strength gusts. Other times, I’d over-compensate for the wind and shank my ball wildly. It’s all very frustrating. More to the point, despite its name, Field Goal Frenzy doesn’t feel very frenzied. Even with the 45-second clock in Arcade mode, there’s only so many kicks you can attempt. Even if I ever master the wind, my score can only go so high. Run for Your Life: In Speedback, you’ve got to elude tacklers on your way to the end zone, but it’s hard to do with such tiny controls. Speedback’s graphics are fairly pedestrian, but that’s not the problem here. Rather, it’s the controls. You’ve got a series of five directional buttons on the left side of the screen, allowing you to run variations on sideways and forward The buttons are fairly slender, though—certainly too small for my meaty paws. So I had trouble making my running back sprint in the direction I wanted… when I could even make him run at all. The game features two modes. Classic gives you three lives, which you lose each time you’re tackled. (You can pick up more lives, as you rack up points for yardage and touchdowns.) 2-Minute Drill challenges you to score as many touchdowns as possible in two minutes. Note that the two minute time-limit only applies to when you’re running and not when the whistle blows after you’ve scored or been tackled. Since it takes five seconds at most to run the length of the field, those two minutes can feel interminable. If someone ever gives you two minutes to live, pray that they’re using the same clock Skyworks does in Speedback.